Safe Forklift Operation. OSHA QuickCard™ (Publication 3949), (June 2018). Sample Daily Checklists for Powered Industrial Trucks. Prepared by OSHA and the Industrial Trucking Association (ITA) Alliance. OSHA notes that this checklist and related graphics were developed in cooperation with the ITA as part of the OSHA-ITA Alliance. Sample Daily Checklists for Powered Industrial Trucks. Prepared by the UAW-Ford National Joint Committee on Health and Safety. OSHA thanks the UAW-Ford National Joint Committee on Health and Safety for granting permission to use the checklists and related graphics. 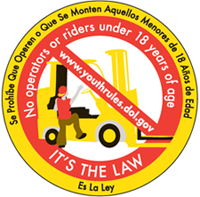 It is a violation of Federal law for anyone UNDER 18 years of age to operate a forklift or for anyone OVER 18 years of age who is not properly trained and certified to do so. Download the Sticker. Powered industrial trucks are addressed in specific OSHA standards for General Industry, Marine Terminals, Longshoring and Construction. Provides references that may aid in recognizing hazards associated with powered industrial trucks and provides examples of possible solutions. Provides links and references to additional resources related to powered industrial trucks.